The first was the Tale of Desperaux. 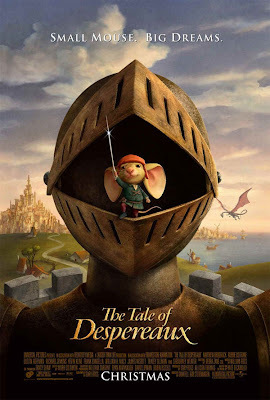 It's the story of a fearless mouse with HUGE ears. The kids were entertained well enough and the story was cute. I just can't get over the scurrying mice and rats. It gives me the creeps. There was a great moral at the end of the story about believing in yourself and standing up for what you know is right - so it was all worth it in the end. We gave it 3 bowls of soup out of 5. 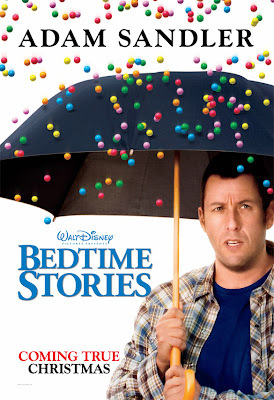 Our second flick of the night was the newest Adam Sandler show - Bedtime Stories. I, personally, really enjoyed this one. It was a very tame Adam Sandler - he stayed in character the whole time and was quite convincing as the kids' uncle. It was so neat to see a [fictional] family come together to support each other in a time of need. The stories they told at bedtime were the best part. How fun to see them actually come to life! This movie poster shows my favorite scene in the movie. Could it really rain gumballs? Kerri Russell and Courtney Cox also starred in this movie. We are fans of both and thought they both did good work in the show. We give this movie 4 Bugsy eyes out of 5.